We live in very specific times. Getting a “like” on a post or picture becomes a necessary daily activity and means of self-validation. Not “liking” something that others posted or that is massively “liked” like may be frowned upon or even viewed as being disrespectful. Plus, it seems that no matter what you do, everyone gets offended very easily. When did honesty, independence and common-sense stop being virtues? When it comes to gold investments and gold investment analysis, it’s surprisingly similar. You either like gold and think that it’s going higher right away or you’re “one of them”. “Them” can be anyone who tries to manipulate gold or silver prices, “banksters”, or some kind of unknown enemy. “Analyst’s” goal is often no longer to be as objective as possible and to provide as good and as unbiased analysis as possible, but to simply be cheering for gold and provide as many bullish signals as possible regardless of what one really thinks about them. The above may seem pleasant to readers, but it’s not really in their best interest. In order to make the most of any upswing, it’s best to enter the market as low as possible and to exit relatively close to the top. What happens before a price is as low as possible? It declines. Why would something like that (along with those describing it) be hated by gold investors? It makes no sense, but yet, it’s often the case. The discussion below can be viewed as something positive or negative for any investor, but while reading it, please keep in mind that our goal is the same as yours – we want to help investors make the most of their precious metals investments. Call us old-fashioned, but regardless of how unpleasant it may seem, we’ll continue to adhere to honesty, independence and common-sense in all our analyses. In the previous free articles, we discussed the short-term situation and we emphasized that the initial 2018 rally should not be trusted. Based on Friday’s session, we took some of our profits on the short position in the sector and we prepared for a rebound, predicting that it could be seen. However, it doesn’t seem likely that this week’s rally is a start of another powerful upswing. Conversely, it seems that another big downswing will follow in the upcoming months. In today’s analysis, we don’t want to get into details of multiple factors that confirm this outlook. Instead, we want to remind you about the most important non-chart factor that suggests that what we saw at the end of 2015 was not the final bottom and we want to discuss one factor that potentially appears to have bullish implications for the long run – but actually doesn’t. The key factor that is rarely discussed is the fact (measured by surveys and feedback that we received at that time) that the sentiment toward gold at the end of 2015 was not very bad. It wasn’t bad at all. Those considering investments in the precious metals market, have been expecting to see higher prices, not lower or steady ones. That’s not what accompanies epic bottoms. What accompanies them is extreme bearishness, disappointment, and running for the hills. We saw nothing from it. The precious metals market might have been oversold – ok. It rallied based on the above – ok. But the key thing that should have been present for the 2015 bottom to be THE bottom – was missing. Consequently, another – final – downleg is still likely to be seen before the final bottom takes place and preparing for it is critical. 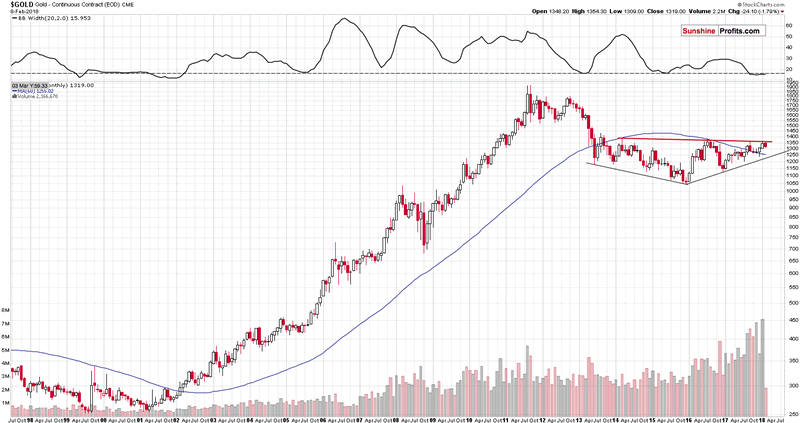 Moving on to the second point that we would like to cover in today’s analysis, we recently received a question regarding the possible formation of a major bottom in gold (supposed technical proof that the bottom was indeed in in late 2015). Let’s take a look at the charts for details (charts courtesy of http://stockcharts.com). The formation is supposed to look like on the above chart. The lower lows preceded the bottom and higher lows follow it. Gold is still below the red resistance line – based on 3 previous highs, but it’s “about to” break out shortly. Let’s start with commenting on the latter. There was no breakout above the marked red line, let alone a confirmed breakout, which means that there are no bullish implications. Simple as that. What is more, since there was no breakout, and gold has just once again failed to move through a resistance and it’s relatively close to it, it’s likely to decline – just like it did previously after reaching the $1,350 - $1,400 range. Assuming that the history repeats itself to a considerable degree, the implications are not bullish, but bearish. Now, moving to the lower lows and higher lows – it impact the outlook in any significant way. Higher lows confirm that gold has been in a kind of an uptrend. However, since it now reached an important resistance, it’s price can start another decline. The only thing that the analysis of the previous lows provides us with, is the major support line, which is current at about $1,220. The mere existence of a support line is something that can trigger a major corrective upswing, but it’s not – by itself – a reason for gold to break above the $1,350 - $1,400 level anytime soon. The gold market, like other markets, has fractal nature, which means that the patterns that work on a smaller time-frame should work on bigger time-frames and vice-versa. Is it really the case? Absolutely not. 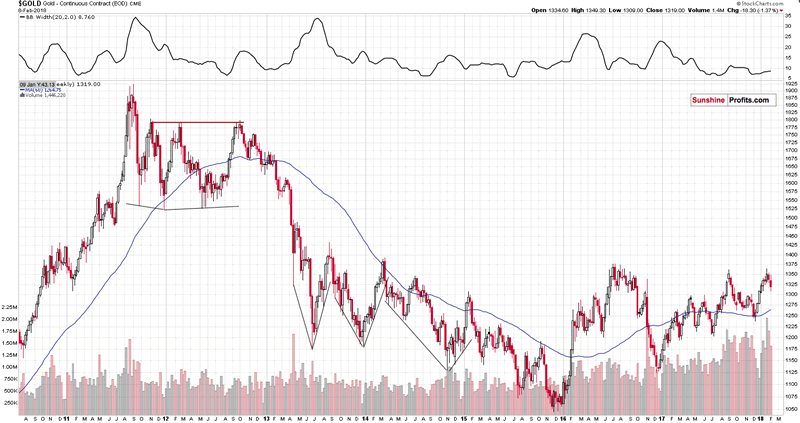 In the previous years, there were several cases when gold moved higher forming higher lows after a bottom. In some cases, it reached resistance before declining again, and in other cases it didn’t even manage to do just that. All these smaller formations were followed by further declines and this includes even the 2012 performance, which was followed by the biggest decline since decades. Interestingly, before this decline started, gold moved to its previous major highs – just like it did recently. Now, why would something that was followed by lower prices so many times and that appears similar to the performance that preceded the biggest of gold’s declines in recent history, have any bullish implications whatsoever if the perspective is changed? We don’t want to go so far to call the higher highs and a rising support line something bearish, but the overall implications of the patterns marked on the previous chart are neutral at best. Summing up, the precious metals market doesn’t seem to have formed THE bottom in 2015 as the sentiment back then wasn’t negative enough. Higher lows in gold since that time don’t necessarily invalidate the above, especially that there was no breakout above the medium-term highs in the past several weeks. On a side note, before calling us perma-bears, please note that we were bullish (in terms of long-term investments) on precious metals for years – until April 2013. We’re looking for the true bottom in the precious metals sector, not because we’re its or gold investors’ enemy. Conversely, we’re that true friend that tells you if something’s not right, even if it may be unpleasant to hear.